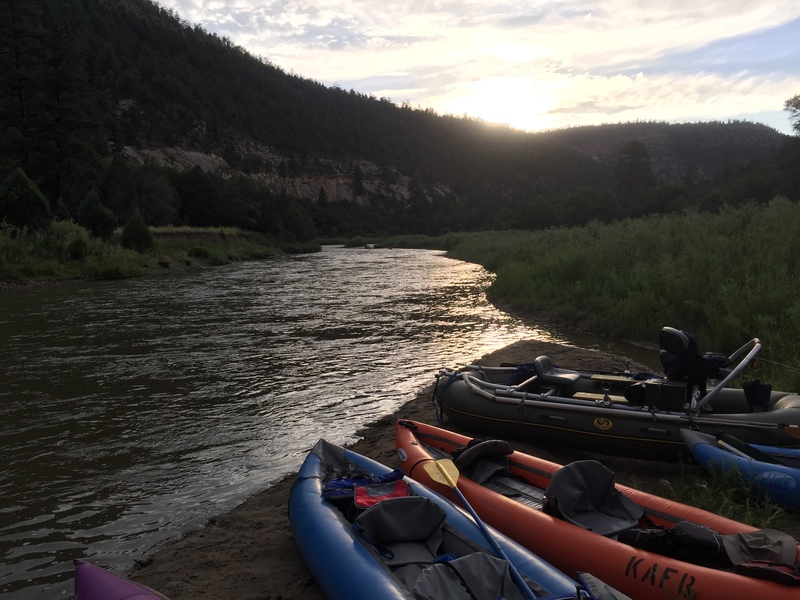 Earlier this Spring a close friend volunteered to put a few of our names into the lottery system to raft the Wild and Scenic section of the Chama River. 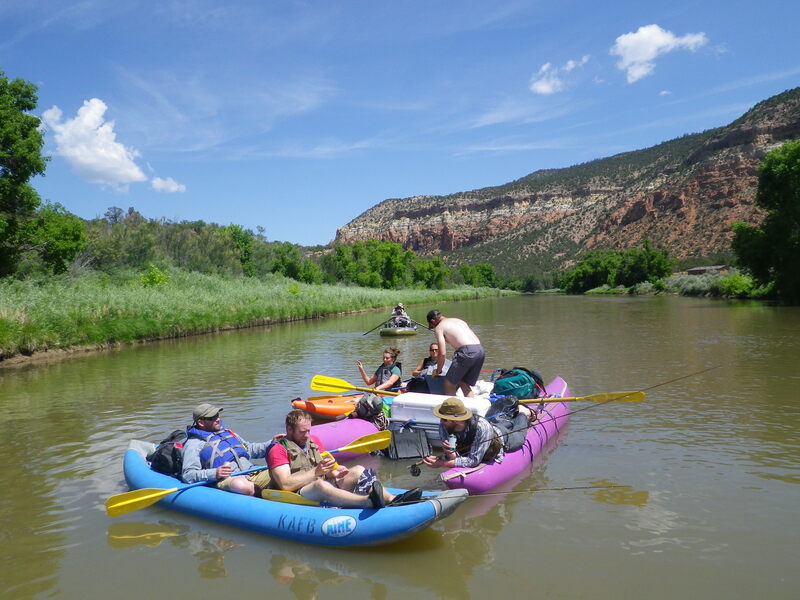 After putting four of our names into the system, we came away with one winning ticket to a weekend adventure on the Rio Chama floating from just below El Vado lake to Big Eddy takeout. The Rio Chama gets it’s start from the confluence of it’s West and East Forks in the San Juan Mountains of southern Colorado. As the river passes through the Colorado New Mexico border it is accompanied by some of the most picturesque landscape in the region. The Chama eventually reaches it’s first man-made barrier resulting in El Vado lake, sitting at an elevation around 7000 ft. Below El Vado, which is where this rafting adventure takes place, the Chama gradually meanders through a large sandstone canyon giving the feel of an old western. This section of the river only contains a few class II-III rapids, easy enough for this group who were on their first self-sustained rafting endeavor (more on this later). At the end of this section of river the Chama enters it’s second man-made entrapment, Abiquiu Lake. 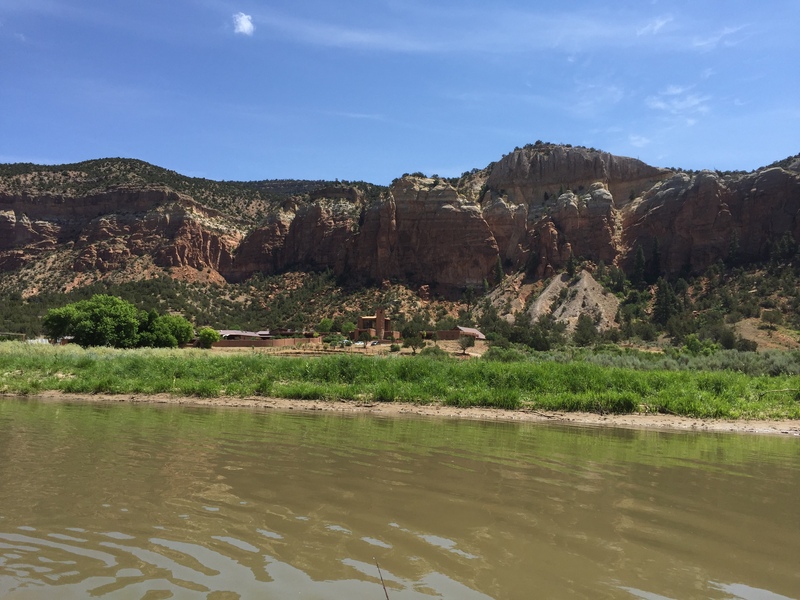 Once the river escapes Abiquiu it makes its way to Española where it meets the Rio Grande to continue its trip South. The most popular section for rafters is below El Vado Lake. Rafters can launch from either El Vado Ranch, a total of 31 miles of river, or Chaves Canyon, about 8 miles of river. The most popular takeout is Big Eddy, but it is possible to takeout at Chaves Canyon too. Flows out of El Vado increase on the weekend to help accomodate rafters, usually these flows are around 500 cfs, give or take. 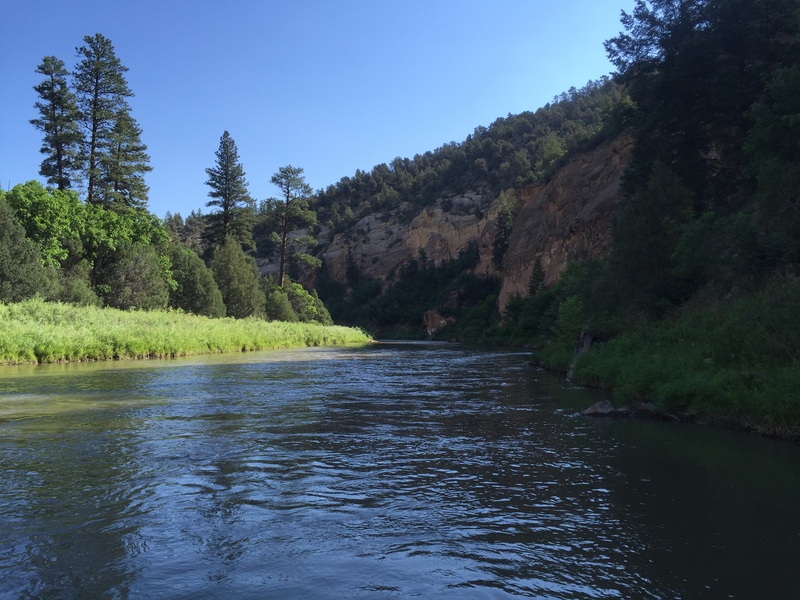 The Rio Chama also offers some good fishing opportunities for both bait and fly fisherman. 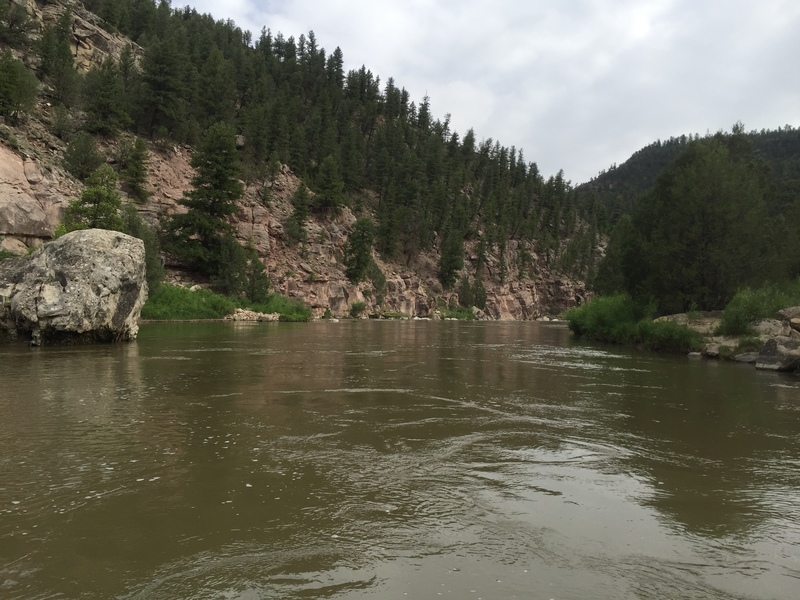 The first few miles below El Vado is some of the most well-known brown trout water in the state and is where the current state record was caught way back in 1946.¹ This section of the river has many nice runs and pools that hold fish. The river starts to mellow out and turn into mostly slack water once it reaches the confluence with the Rio Nutrias, about 4 miles below El Vado, until it enters the Rio Chama Canyon Wilderness. 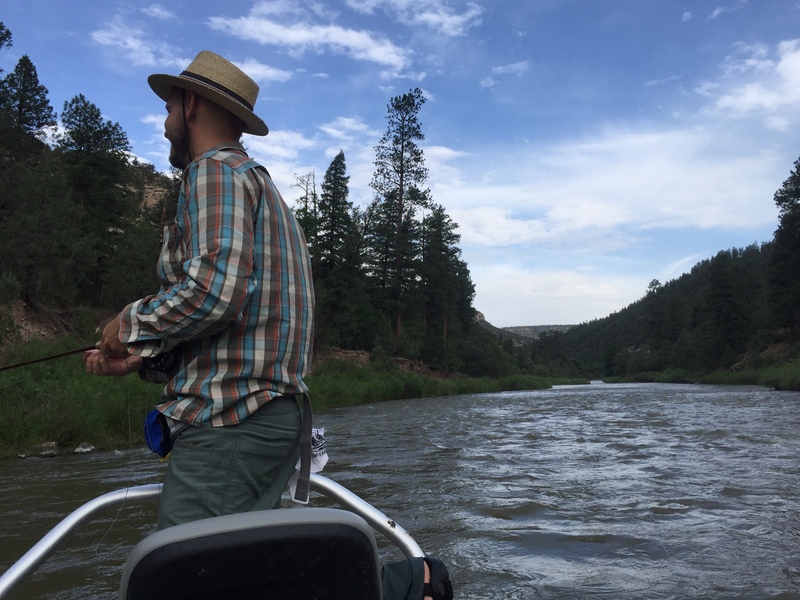 The Rio Chama Canyon Wilderness area had some amazing and remote water, but we weren’t really able to fish the area well enough to get an idea of what the fishing is like (this is a nice way of saying we didn’t catch any fish there). 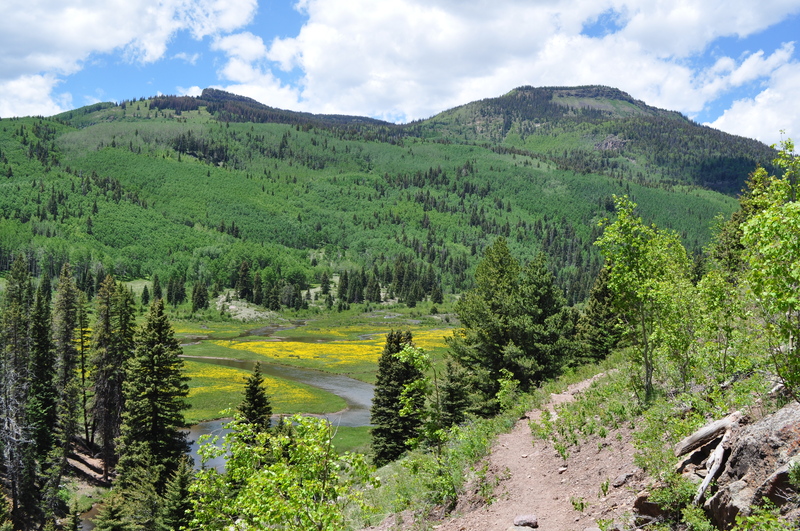 The other nearby regions of the Chama, above El Vado lake and below Abiquiu, are also good places to try your luck. I’ve had some great days fishing just above El Vado in the fall. Our group, which consisted of 12 people, drove up to Big Eddy takeout with a quick pit-stop at El Parasol for dinner on a Friday evening. The plan was to start early Saturday morning and finish on Monday. We realized, however, that the flows were going to be lowered mid-day Sunday and that we would have to end our trip a day earlier than originally planned. 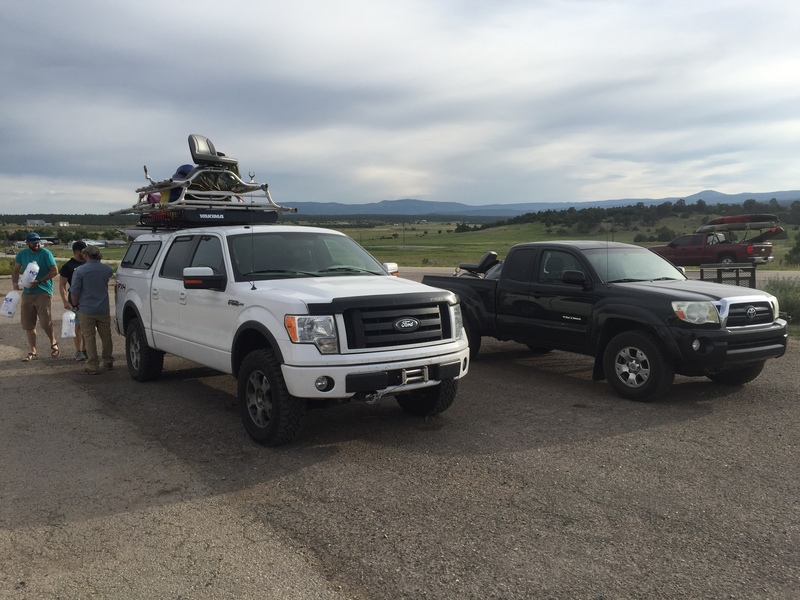 Two of the people in our group had recently purchased some 2-man fishing rafts from Big Sky Inflatables, which is kind of what initiated the trip in the first place. The rest of our fleet was assembled of a borrowed kataraft (known by the group as the purple people eater) and 3 inflatable kayaks that we had rented. 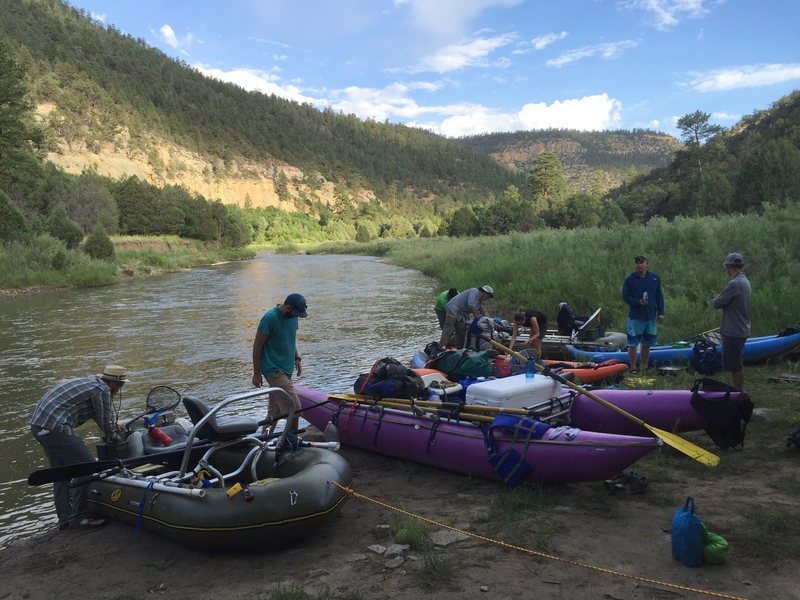 On the morning of launch we sat at the rivers edge pumping up rafts and putting together frames as other groups arrived with their already inflated rafts and set sail on their adventures. It was also pretty clear that the rafting experience in the group, which ranged from 2 trips to none, was a little lacking (but we survived with just a few scrapes, a couple bruises, and one or two torched egos). After some final checks we boarded our vessels and got on our way. I started out on one of the watermasters with the anointment of rock-pointer-outer, turns out I can’t see to save my life as we got stuck in the first few minutes. I really didn’t mind being at the front on this section of the river, because if you’re at the front you get to fish! 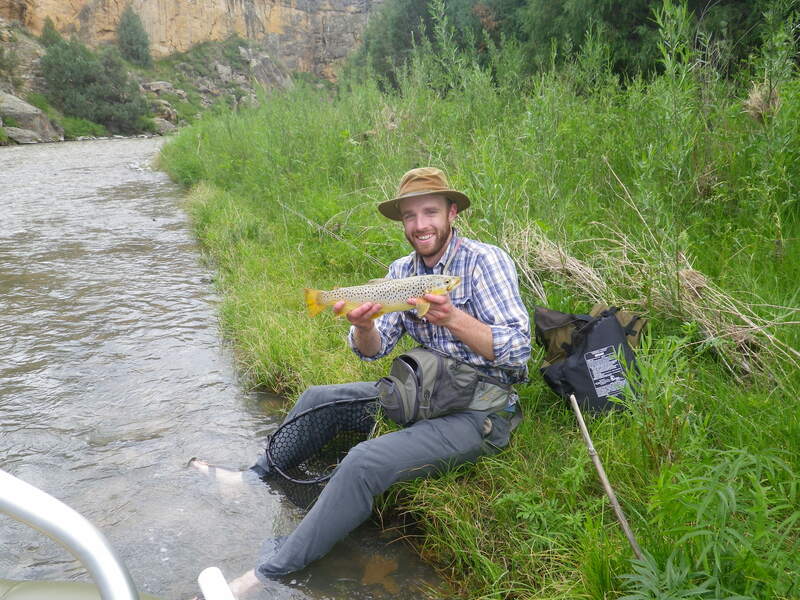 On past fishing trips to the Chama the flows have always been really low, below 150 cfs. The river at ~500 cfs is a whole different beast, especially on a raft. We drifted by a few spots I recognized with no luck, I’m used to that on this river. After a few rock bass I realized snagging your line was a little more complicated on a raft. Just when I was about to rip the nymphing rig off the line and stick on a dry fly out of frustration my indicator plummeted and when I set the hook I felt a few tugs back. After some maneuvering from the captain, we landed a nice lightly colored brown trout on a rubber legs, whew the skunk was off! For whatever reason I have this strange nervousness about getting skunked on fishing trips, and yes its happened once or twice. When that first fish comes in I always sigh in relief and get to fish the rest of the day pressure free. Well, it turns out that sigh of relief was warranted as that was the highlight of the fishing day. Chris, the captain of the watermaster I was aboard, missed a fish that slammed his streamer right when it hit the water and a few others said they had missed a fish or two. I expected the fishing to be pretty tough. However, I figured that between 6-7 fisher people we would be bound to accidentally catch a few fish, which is why I am not a betting man and never fish for dinner. After snapping a few pics it was back on the raft, but with myself on the oars. After I promptly got us stuck on a set of slightly submerged boulders, we continued our day down the river with Chris slinging his large streamer pattern. Whenever I’ve watched people steer rafts I’ve always assumed it was easy, as they glide back and forth across the river. Turns out, piloting the raft is kind of counter-intuitive. After I was finally getting the hang of steering it was time to hand the reins back over to Chris so he could guide us through the class II+/III rapid. As we coasted in the calm pool above the rapid, we could hear the heroic screams of our group conquering the obstacle in front of us. As we peered over the top of the rapid and started our descent we let out grunts of pure manliness. This was definitely the most challenging obstacle of the trip with large boulders requiring quick steering from the oarsman. When we reached the bottom of the rapid we regrouped with the others. As we approached we could see part of the group was soaking wet. Turns out one of the watermasters almost got turned over throwing some of it’s occupants into the white water. Another person got tossed from one of the inflatable kayaks too. Luckily, everyone was alright and only had some minor scrapes and bruises. 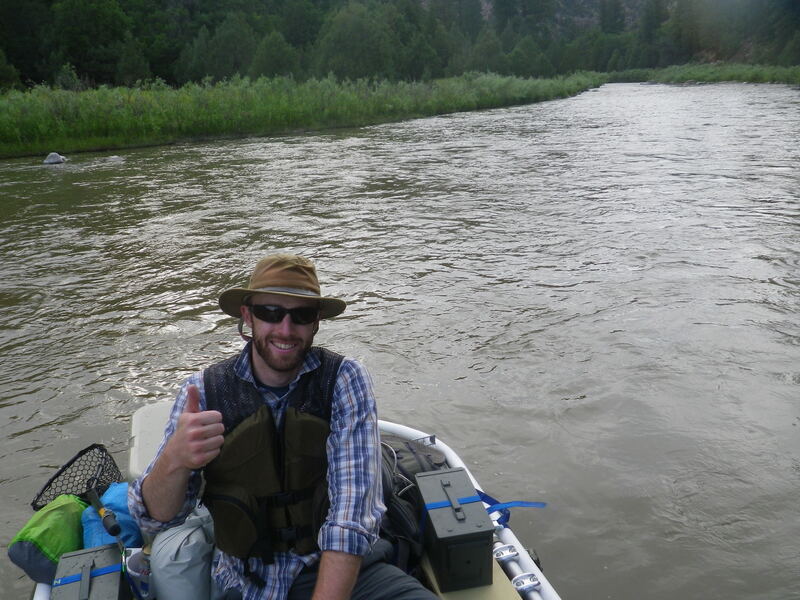 We counted our blessings and continued downstream on the lookout for our intended camp. 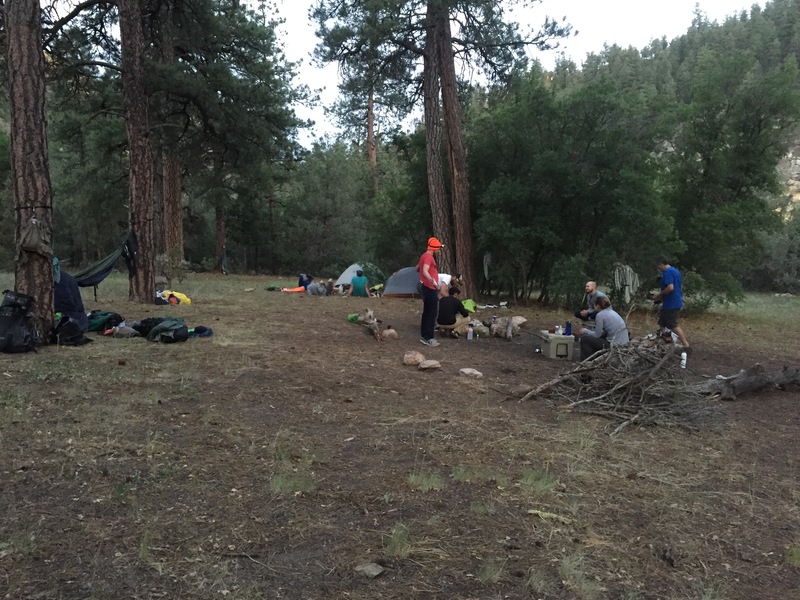 There are many established campsites scattered throughout the wilderness area. Most of them were identifiable from the well-mannared stone stairs leading up from the rivers edge. Of all the locations available, the group masters decided we should shoot for Tiger Wall Camp to hideout for the evening. I’m not sure anyone in the group actually knows if we stayed at tiger camp, there was nothing that identified it as such besides a giant riverside wall with large streaks. The camping area was perfect. We had a great place to park the rafts and kayaks for the evening and a great flat-ish area to setup tents and hammocks. Everyone gathered around to eat dinner and laugh about some of the events of the day. Camp was really nice after being in the sun for the entire day. We were awoken by a small rain storm at around 2:30 in the morning. Not sure if I was actually woken up by the rain or the strobes of headlamps from some of the group who decided to sleep underneath the stars. I figured at any moment the no-tent group would be barging in my tent to hide from the rain. Luckily for the star gazers, the rain ceased in only a few minutes. When we woke in the morning we knew time was of the essence as flows were going to be substantially lowered around 9 am. Brian, one of the group masters, ran around like a giddy school girl trying to wake everyone up to get the rafts loaded and on the river. Its always nice to have someone in the group who likes to keep everyone punctual. After some quick breakfast we loaded the rafts, I boarded the purple people eater with captain Brian and we began our final day. I must say, that water is pretty cold in the morning! A calm bend in the Rio Chama Canyon Wilderness. Day two was mostly comprised of flat sections of water linked together by a quick run or two until we passed the monastery. Once you exit the wilderness area the river really mellows out and the landscape changes from a steep canyon covered in ponderosa pines to a wide multicolored sandstone canyon lined with juniper trees. You can also feel a slight change in temperature as you are a little more exposed to the elements (in New Mexico that mostly means sun). As the group descended out of the wilderness area we regrouped to create the most amazing floating experience (see below). We actually just made fun of each other, splashed and enjoyed some cold beverages as almost one. The monastery section is followed by a few quick rapids, where the purple people eater almost ate me and the group left us, and then another long flat section. Brian and I traded spots after the rapids so I could get some MANTIME on the oars. I took us sailing down Bridge rapids where we met back up with the team. Turns out we had two of the kayaks spill over in this section, but, besides a broken fly rod, everyone was fine. We switched some seats around and one of the girls jumped aboard the purple people eater. As she looked at me and asked “You know what you are doing, right?’ I gave her the most confident “Hell yeah!” I possibly could. Truth is, I had no idea. The remainder of the day was pretty straightforward, besides constantly getting the purple people eater unstuck because the flows were getting so low. We cruised through the last few sections of rapids with no major issues (alright, I almost smacked Erica in the back of the head when one of the oars got stuck on a boulder, but she didn’t notice so no big deal). As we rounded the final bend before Big Eddy takeout, I casually ran into the canyon wall and brought ole’ purple people eater right up to the bank, in front of every one to bring our rafting trip to an end. I heard a few people applaud at the sweet moves, a great way to wrap up an awesome trip. This trip was an absolute blast and I would recommend doing it, as long as you have access to a raft or some kayaks. The purple people eater was a little large for the flows when we ran the river, so it was constantly getting hung up in shallow sections (we also had no idea what we were doing). The kayaks seemed to get through fine, but they were a little less comfortable and gear storage was an issue on them. I had absolutely underestimated the rapids. I think people have a tendency to think they are much more adept than they actually are, and that was surely the case for me here. I am no rafting expert, so forgive me if I am just spewing out garbage here, but I think you should have the oars-people in your group have at least a little more experience than we did. In total we had 6 or 7 instances of people getting tossed from their kayak/raft and almost flipped one of the watermasters twice. Luckily, and I do mean luckily, no one was injured, besides the minor scrapes and bruises. With the water levels where they were there were plenty of exposed rocks to ruin someone’s day. My experience with fishing on this section of river is definitely mixed. I have had some days filled with lots of fish and I have had some days filled with not so many fish. The bait fishermen always seem to do very well, but us fly fisher folk seem to have a more mixed review. The water in the Rio Chama Canyon Wilderness area was awesome. I wish we would have spent a little more time in there at some of the good looking sections. Hopefully next time. If you do decide to test your luck bring your streamers and nymphs. If you have any questions shoot me a message or use the comments section below. Also, let me know what you think in the comments section below! Christ of the Desert Monastery. Sunset at Tiger Wall camp. Piloting one of the watermasters. A great view from the pilot’s seat. 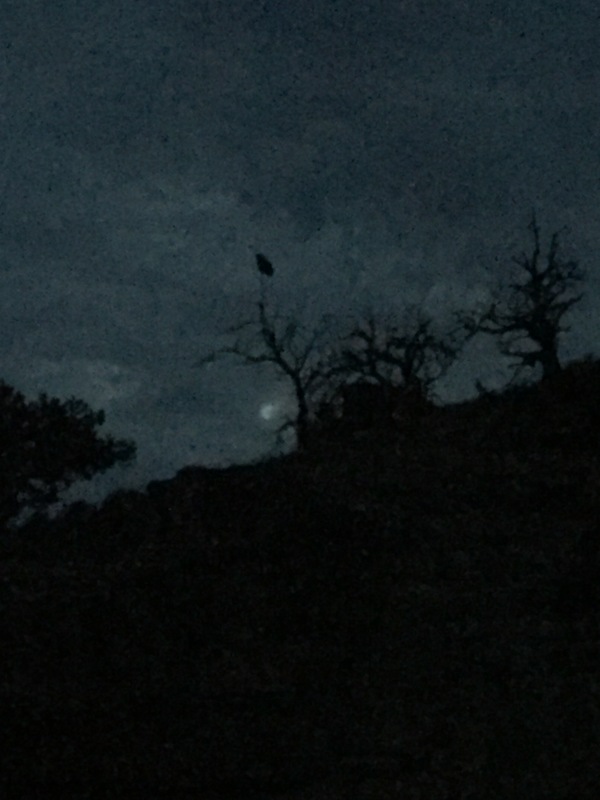 Woke up in the middle of the night and saw this owl perched high above. 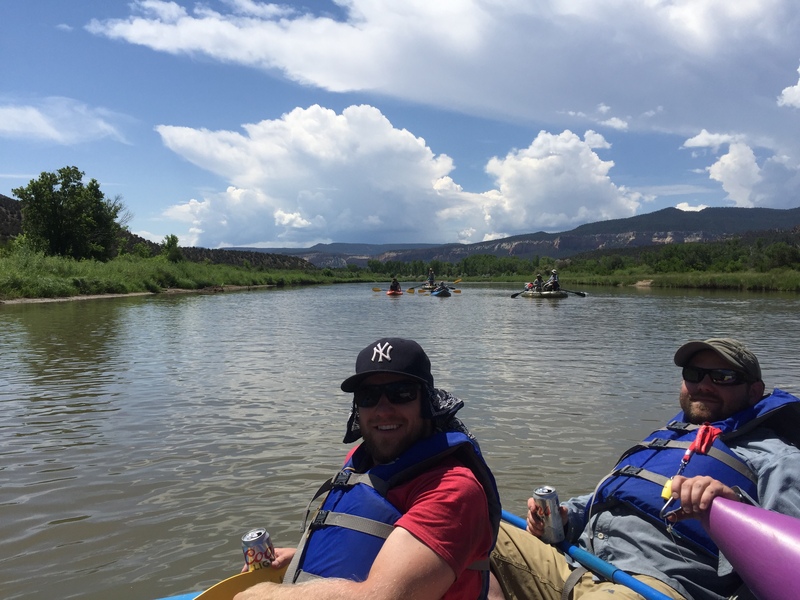 Men being men on the Chama river. Thats one way to load your frame. Probably going to have a few bugs to wash off. Coors light baby!!! Good story!!! Very informative too. Where are all the naked photos of all you dudes though?! Oh dude! Wish you could see them. I am looking way tan! fun read Emil. Wish I was there. But more importantly, I wish could see your tan lines. I demand a retraction of the insidious insinuation that my rowing skills were subpar. My loss of people overboard to people rescued ratio was plus one. Secondly, I demand that you lie and say I caught a fish. I never said you skills were subpar! You kept Emil dry and alive baby! I will edit to say you caught many fish. When’s the next post. In another two years? Yeah, going to try to break the current streak.